Here are some options, which may be useful to those shopping for Mother's Day, spring birthdays or other April occasions. My mother could sniff out an "old lady" gift faster than substandard gin in her Collins. Those were relegated, after perfunctory thanks, to the depths of her guestroom dresser. So I take it as a mission to find gifts that are kind to the challenges of mobility and vision but aren't dull or dispiriting. Tell me how I did! A washable three-quarter sleeve cotton cardi does up easily and makes a snuggly spring layer. Price, $98 from Pendleton. 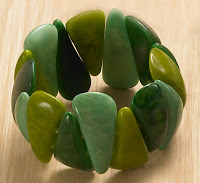 The organic shape and gorgeous colours of this tagua nut bracelet from the Art Institute of Chicago makes a chic spring accessory. It's a stretch style, so no fiddly clasps. Price, $72. 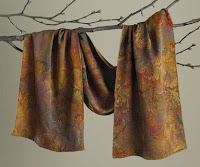 A 56" x 11" silk peacock marble scarf is less fabric to manage than a shawl, rich, elegant and so pretty with nearly any colour top. Also from the Art Institute of Chicago; price, $65. Spring is rainy on the Cape, and my friend is longing to get outdoors again. 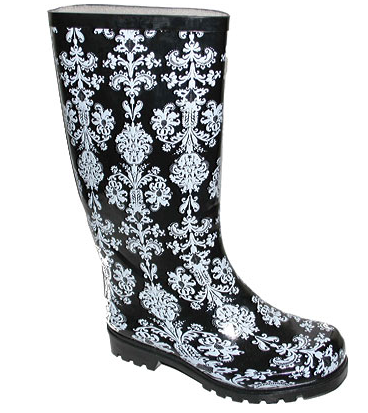 These cheeky, cheery Victorian print rain boots will get her going. And I know her size, it's the same as mine. Hmm, rain boot twins? Price, $49 from Shoebuy.com. 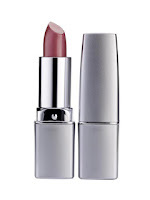 A new lipstick will lift her spirits and her looks. Since it's her name and she likes the brand, I'd send her Marcelle's long-lasting Rouge Vitality lipstick in Frivolous Pink, $10.25. 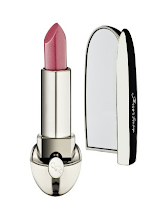 But for another woman, I'd pick lippie in a beautiful case: the Guerlain Jewel Lipstick Compact designed by Place Vendome jeweler Lorenz Baumer. 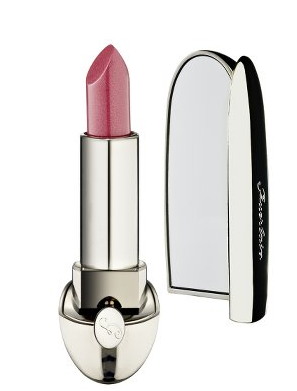 One click opens the lipstick and mirror, perfect for restaurant touch-ups. (Not that the elder would refresh her make up at the table!) She'll get major powder room props when she flicks this open with one click. Price, $46 at Sephora. An elder Mum appreciates beautiful loungewear as much as her daughter, but delicate silk requires too much upkeep, and she might not want to answer the door in it. Hanro's waffle knee-length robe wraps her in textured cotton with a pretty trim at cuffs and hem–and it's washable. Price, $160 from Bare Necessities. Writing this on a drizzly morning, I'm leaning toward the rain boots (for both of us!) But I'll wait to hear your ideas, or your vote. Let's see now - when my mom had a stroke, she spent a long time in rehab - something pretty in exercise clothing that is not too crazy-young? Brava! At 43, I would love to receive any of them. Aesthetically I'm partial to the Cardi, with the lipstick tucked into the box for fun. Very timely, as my mother's birthday is tomorrow. 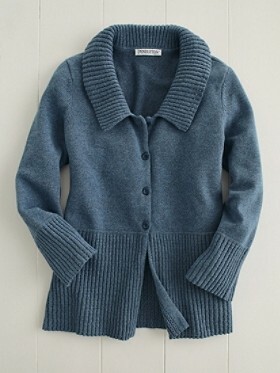 The cardigan is gorgeous. I love the cut and the colour. I'd be pleased with any of your choices except the robe. Not because I don't like it but because I already have a bunch of "robes as gifts" languishing in my own guest room. I suspect anyone over 70 does too. I always instinctively want to wrap someone dear up in something protective and snuggly so would also vote for the cardigan or robe-- but would add something lovely and flattering like the lipstick or bracelet as well! What a dear friend you are and what exquisite taste you have! Absolutely the cardigan with the lipstick of her name. I like them all except the boots (sorry, since that's where you were leaning!) - they seem too cutesy and therefore patronizing. My favorite is the cardigan. I vote for the cardigan and a pink lipstick...something to keep her cozy and another to elevate her spirit! I seem to be in the minority in my appreciation of the bracelet. What gorgeous greens! I like all your choices, although the robe isn't exactly thrilling and may duplicate. The rest are really quite fun. 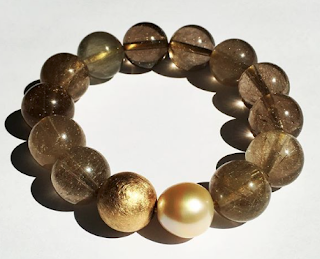 I love the bracelet as well. I had already admired the sweater in a recent Pendleton's catalog, but don't need it because I have something similar. I think it would be a GREAT gift. I had never thought of giving someone lipstick before. I have given a lipstick case. Coach used to make them with a little mirror inside. Sadly, they don't have them any longer. Actually I think these are all wonderful, but especially love that bracelet provided it jibes with her taste in jewelry. Now I must say, my very manners-conscious grandmother used to pull out her lipstick and tiny mirror after a meal and give herself a quick, deft swipe right at the table. From this I always took it to be acceptable. When I posted about this on my blog way back, the Nay's outvoted the Yea's by 2-1. The boots, absolutely! I love real rubber boots--wet feet can really spoil your day--and for Cape Cod, what could be more appropriate than that combination of practicality and a delicate nod toward the past? My best-ever Valentine from my husband was a pair of red Hunter Wellingtons, and I've given rain boots as gifts to many of my favorite people: tall "ointment pink" Wellies for a friend who loves that color, short tartan and apple green boots for my daughters, sturdy black fireman boots for my husband. Everybody loved them--and used them! I tied my friend's boots up in in a big pink cellophane bag, with a small present (like that pretty lipstick?) tied to the bow. All your choices are lovely, but the boots made me smile. My mother's birthday is approaching. 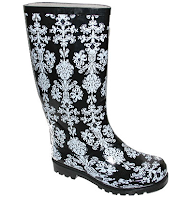 I think a pair of fancy rain boots might be just the ticket. She wouldn't splurge on something like this herself, but she'd enjoy wearing them. The 'no clasp' bracelet would be a good gift also. Thanks for the excellent suggestions. I guess rain boots are a regional choice. I don't know anyone in Dallas who has them. If they do, I've never seen them wear them. This is what makes blogs so interesting to read---regional differences. I like the boots in this or another pattern, and the bracelet. The scarf might work, depending on her colouring. I loathe the cardigan. My 88 year old mother would smell 'old lady' on it fifty feet away. Besides, it doesn't have pockets and is a boring colour. If you want to get her a robe, get her a floor length turquoise fleece - old ladies like warm. What about some great designer earings with hooks instead of stud fasteners? Something from L'Occitane? A bottle of Glenfiddich? My rule is to never buy anything for an old lady that I wouldn't wear or use myself. When you add mobility and vision issues into that mix, you do indeed have some challenges. William is so right - you are a valuable and valued friend with great taste and generosity and a great big heart. My mother is 83 and dislikes "old lady" gifts, too. Yet, she also finds it hard to shop for herself and appreciates new clothes. I think the cozy sweater would be a wonderful gift. I agree with the others that the lipstick with her name on it is a "must" to include. I think these two items would be fun to open, as well as useful. P.S. My mother finds it hard to put on high boots at her age; perhaps a lower pair would be easier for Marcelle, if you go that route. P.P.S. Great post! I usually buy my mother something from Talbots. A cardigan sweater that Pseu recommended was a big hit. I am partial to obscure DVD's from the golden age. Like the Thin Man boxset, anything with William Powell, Myrna Loy or "Forbidden Hollywood" pre-codes or The Carole Lombard set. I would rather get classic movies than anything else and many seniors I have given them to love them as well. Ebay has lots of good titles. Lipstick not so much, I am particular to certain colours. The boots don't seem wearable. 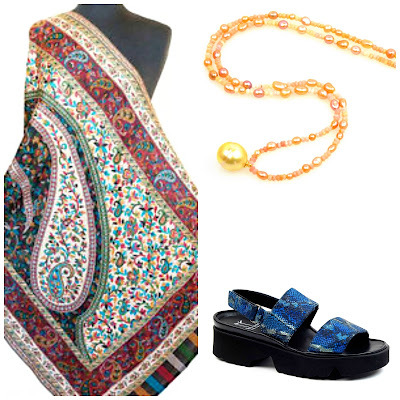 Jewellery - I am sure she has lots and taste is variable, sweaters and robes are too predictable. I have bought a nice cashmere tee shirt from Landsend for somebody who was very ill and they ended up buying a few more, they loved them so much. Hmm. I don't know! My mother always tells me what she wants so I never think about it:). All: Somehow Blogger ate my individual comments and I haven't tine to re-do them, so will summarize: thanks! Interesting how polarized the votes are, people love/hate both the cardi and rain boots. And thanks for the ideas I haven't thought of like a cashmere tee. Anon@4:57- Her son has deluged her with movie dvds, it's a great idea. diverchic: Wouldn't give a fleece robe, polyester is neither her thing nor mine. For a lot of older folk, more "stuff" is not the thing. My sisters and I often give our Gran (soon 98) a generous gift certificate to a small local bookstore. She loves going and getting recommendations from the owner. Since she's a voracious reader, it's a perfect gift. And as cliched as it may seem, our other gran loved getting exotic fruit-of-the-month gifts -- the kind of thing you won't find in the local supermarket, like cherimoyas, mangoes, etc. For those on a reduced budget or with limited mobility, that sort of treat is often out of reach. Rubi: The fruit delivery is a terrific idea! I will use it at Christmas. My friend has a Kindle- brilliant as every book can be large print. Not "old lady" gifts or I am prematurely old as I covet them all, well except the boots, but I do love rain boots. Part of me would vote for the sweater, which I was eyeing before you posted it with the lipstick as well, and part of me says go for the bracelet if it is her style. The sweater speaks of comfort but also of staying home (recuperation) and although the lipstick promises more, the bracelet says there is life beyond the current setback, if it is her style, of course. I know I am in the minority here, but that scarf is gorgeous and sumptuous. Nothing like a good silk scarf. I would pair it with the pink lipstick and an invitation to lunch. 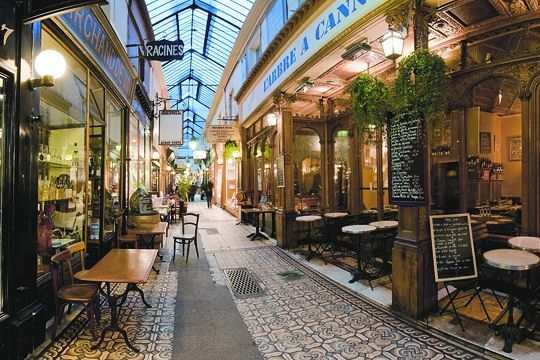 Beatriz: I'm fond of scarves and so is Marcelle! Plus, they are easy to ship (and far cheaper postage than some of the other ideas.) I'd love to add lunch but we live very far away from one another.